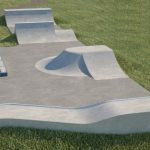 Hilton skatepark is made up of metal ramps on a tarmac base and is the standard back and forth build shared by most council builds. 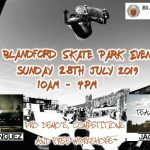 On the back side is a wide mini ramp with a flat bottom and features a flat bank and a quarter pipe coming off one of the platforms. This leads up to a large funbox with a hubba and finishes on the back end with another quarter pipe. Along side this run is also a kicker with adjoining stair set. 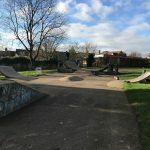 This is a good local park with a decent set of obstacles, perfect for beginners to learn the basics however if you are after a more challenging skate then check out some of the other skateparks nearby. Tutbury & Hatton train station: As it is a long way from the station it would be recommended to get a bus or a taxi to Hilton skatepark. Peacroft Lane bus stop: Exit the bus onto Egginton Road and take the road Peacroft Lane south until Hilton skatepark is in sight. 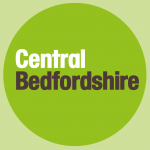 There are no on site toilets but there are free to use facilities in the nearby village hall.